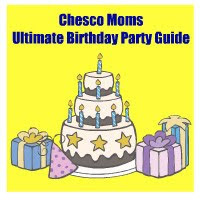 Chester County Moms Game Day Fun…”Big Game Day” games for kid’s…. This Sunday fans young and old will gather together to watch the Colts & The Saints play in the Superbowl. 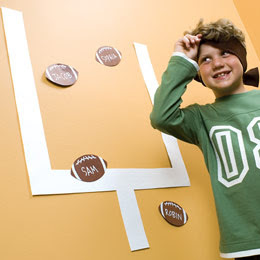 Keep your little fans entertained and bring the thrill of the gridiron to your living room wall with this pigskin version of Pin the Tail on the Donkey. For the game pieces, first create a goal post from two-inch-wide strips of poster board. (The uprights and the crossbar are each 20 inches long, and the post is 6 inches tall.) We attached ours to the wall using tape. For the footballs, cut 5-inch-long shapes out of brown card stock. We found some in the scrapbook aisle of our craft store that looks like football leather. Use a white paint marker to decorate and add players’ names to the footballs. Don’t have a paint maker.. a black marker or white crayon works too. Put a blob of tape on the back of each one. Players line up about six feet away from the goal. One at a time, each player is blindfolded, spun around three times by another person, and set loose to try to stick their football between the uprights. (No reaching out your empty hand to feel the wall.) Play several rounds with 3 points awarded for each field goal. Highest score wins. Hit the dollar store for football inspired prizes or go simple with something like coloring books You can also offer chip or pretzel snack bags as prizes…chips & pretzels. Doesn’t get anymore football than that!